Previous chapters have emphasized the physiological responses of mature plants to their environment. The environmental stresses encountered by plants and optimal physiological solutions, however, can change dramatically from the seedling to mature to reproductive phases of plants. Following germination most species pass through several distinctive life phases: seedling (loosely defined as the stage during which cotyledons are still present), vegetative (sometimes with a juvenile phase preceding the adult phase), and adult reproductive. 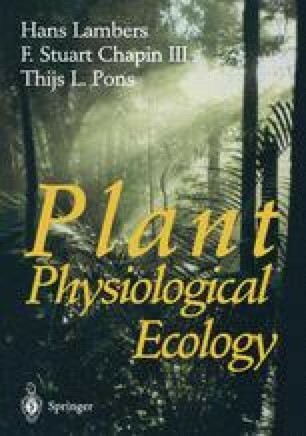 This chapter addresses the major ecophysiological changes that occur in the life cycles of plants. These involve changes in development (i.e., the initiation and occurrence of organs), in phenology (i.e., the progress of plants through identifiable stages of development), and in allocation to different plant parts. The pattern and duration of developmental phases depend on environmental conditions and acclimation to specific environments.